I run hot-and-cold on variants sometimes, enjoying ones that look cool but getting annoyed when companies like Marvel have weird schemes to boost sales. 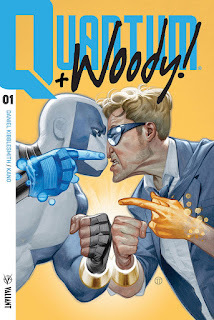 Well, Valiant has found an ingenious way to both make-fun of variant covers and put-out one that I imagine everyone (myself included) will want. They are debuting, "The Most Variant Cover of All Time!" Featuring every gimmick you can think of (except glowing in the dark, which they admit they couldn't manage), this cover has lenticular logos, chromium bars, foil, die-cut parts, hand-numbering, and a random extra hero who is attached as a sticker. If stores want it they have to order 250 copies of the new, "Quantum and Woody," comic coming December 20th and are limited to one-per-store. Its an absurd rule to order the comic, but it's supposed to be dumb, because if you're going to have, "The Most Variant Cover of All Time," it makes perfect sense you have weird rules to acquire one. Basically, Valiant is daring stores to buy-in to this self-aware gag about variants and saying, "You want silly variants with a high buy-in? Oh, have we got the comic for you!" I will try and acquire a copy of this comic for myself so that I can both review its contents and offer in-depth thoughts on the cover itself. It may not be possible, but I'll sure try! 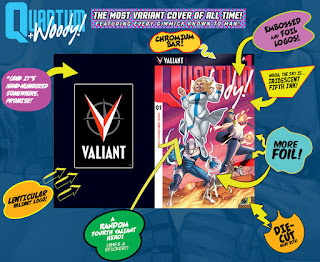 In the meantime, I encourage you to visit Valiant's website and check-out all their other quality titles!